Mountainview Cemetery (PDF) at the east highway entrance to town has plots available. 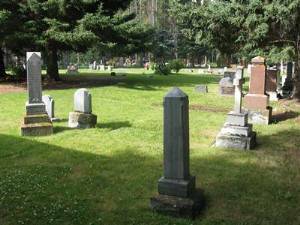 How is a burial arranged? The next-of-kin or personal representative of the deceased must complete a burial application, a monument application and a statutory declaration. Include special requests or arrangements with the burial application. Applications must be received three business days prior to the interment. An invoice for the plot or grave, interment services and monument application will be sent to the applicant following the burial. Funeral processions must reach the cemetery by 3 p.m. on the day of the burial. Burials are not usually held on Sundays or statutory holidays, but alternate arrangements may be made with the Town of Banff and may involve additional fees. The applicant is responsible for purchase of a mandatory grave vault from a funeral home for any full burial. On the day of the burial, Town of Banff staff will prepare the plot/grave and direct the family or representative to the grave or plot site. Once the private service has concluded and the urn or casket has been placed in the ground, town staff will return to close the grave. Should you wish to dedicate a bench in memory of a loved one, see the Banff Bench Program for details.